Megan is one of three athletes on the U.S. Women’s wheelchair basketball team coming out of the January Selection Camp vying for a chance to make it to Rio for her first Paralympic Games. She was part of the U.S. Women’s team that placed fourth at the 2014 IWBF World Championships and helped bring home a gold medal from the Parapan American Games in Toronto in 2015. 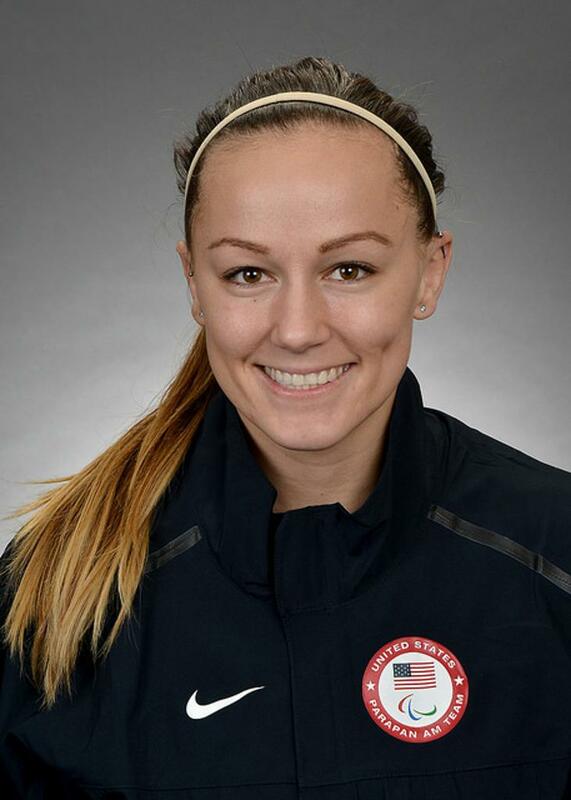 Megan was also a member of the 2014 U.S. Paralympic Canoe National team and won two silver medals at the 2013 Paralympic Canoe World Championships. Place of birth: Tacoma, Wash.
High school: Peninsula, High School, Gig Harbor, Wash.
Megan’s mom is Wendy Ricketts and her dad and step mother are David and Jackie Blunk. She has four sisters, Kelci, Shanae, Monique and Alaisa. Hobbies: Watching documentaries, playing catch, hanging out with friends and spending time with her dog. She also loves to drive and go on any kind of car ride. NWBA: Who is your hero and why? Megan: My hero is my friend Tony. He passed away a few years ago and I only got to know him for two years but he was the most positive, outgoing, passionate and caring person that I have ever met. He got caught up in a bad situation when he was younger and he was shot in the back and became paralyzed. From that day forward he completely turned his life around and did everything he could to help other people make their lives better as well. NWBA: When did you start playing wheelchair basketball? Megan: I started playing when I was 19 years old after I was in a motorcycle accident where I broke my back and became paralyzed from the waist down. NWBA: Do you play any other sports? Did you receive any awards from other sports? Megan: I grew up playing every sport and I had the opportunity to play after my accident. I played wheelchair basketball and competed in Paracanoe where I won two silver medals at the 2013 Paralympic Canoe World Championships. NWBA: You have been very open about your battle with depression and your desire to help others. Can you elaborate? Megan: It is really scary when you open up about it. I have had it my whole life. You are so sad and you think no one can understand it. You don’t want people to think you are weak. You hold back. You can be filled with self doubt. Because of my experiences, I want to help people going through depression and help them fight through it like I am. I believe in myself and in all these things I have been able to accomplish. I have so much support. So many people have always believed in me and are cheering me on. I am so grateful. NWBA: How has Paracanoe helped your wheelchair basketball game? Megan: With Paracanoe it is an individual sport and you have to rely on yourself. The training is a lot stronger. There is more cardio and non-stop working on your arms. It gave me good balance and has made me more solid. Both sports are so different. I like training for a team sport more. NWBA: What, if any, are your volunteer activities (coaching etc.)? Megan: I have volunteered at multiple wheelchair basketball camps for the University of Illinois. NWBA: Do you have any pre-game rituals or superstitions? Megan: I just like to start shooting around as soon as possible. It helps me to calm my mind and focus in on what I am doing. NWBA: Why do you play wheelchair basketball? Megan: I play wheelchair basketball because I love being a part of a team, playing a game that requires so many different skills and because it gives me the opportunity to always push myself to be the best that I can be mentally and physically on and off the court. NWBA: What is your favorite basketball moment? NWBA: Do you have any pets? Megan: I have an amazingly sweet dog named Keela. NWBA: What is your short term goal? Megan: To graduate with my Masters degree and play at the Paralympics. NWBA: What is your long term goal? Megan: My long term goals are to be a counselor for kids and adults that are struggling to find happiness in their lives and to be a motivational speaker at grade schools and high schools. NWBA: Do you have any social media accounts that fans can follow you on?